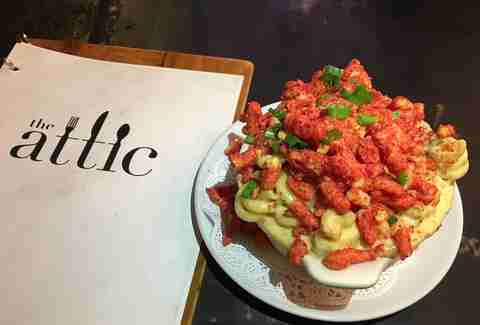 Cheetos Are the Newest Weird Food Trend Taking Over LA. Here's How. There are two groups of people in LA: the health nuts who juice and eat kale salads, and the junk-food addicts who love their dishes powdered with cheese dust. If you belong to the latter category, then you most likely appreciate the fact that our city has been blessed with not only the genius creation of Taco Bell’s Doritos Locos Tacos, but also Burger King’s Mac N' Cheetos, which is both a food abomination and gift from the gods. 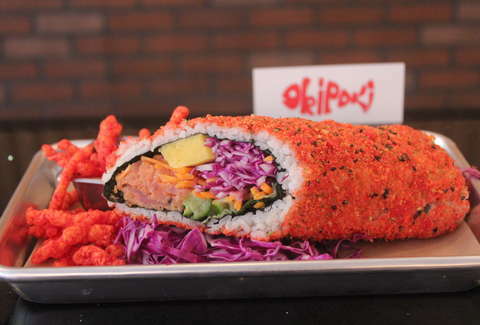 And now it isn’t just fast-food joints jumping on the Cheetos train: Non-chain restaurants everywhere from Okipoki to Ameci Pizza are straight up coating and crumbling the curls into their stoner-fied dishes. To get down to the bottom of how Cheetos got so hot and where this trend is going, we had to put our diet on hold for research on some food that’s orange-finger-lickin’ good. Why did Cheetos become the new it thing? Stuffing our faces with neon-orange, cheese curls is a kind of battle cry against health food, according to Nevin Barich, a food-and-beverage market analyst by day and junk-food blogger by night. “Whenever there is a big push towards healthier food and healthier beverages, I think in contrast, there’s always going to be a kind of backlash... where you can see an opposite trend towards items that are basically the opposite of what the primary trend is,” he says. Cheetos also just happen to bring back those warm and fuzzy feelings from our childhood. “There’s something to be said for nostalgia,” Barich says. Nobody thinks they’re reinventing the wheel here, but they’re bringing a piece of their childhood into their dishes in a big way. For Hayk Igraryan, owner of Ameci Pizza in Burbank and Glendale, his inspiration for creating his Hot Cheetos Pizza came from his school days when his buddies would top their pies with the fiery and crunchy snack. He admits that his pizza idea isn’t “anything crazy new,” but he doesn’t just simply toss Cheetos onto the slices: There’s some finesse that he puts into his junk-food art. The Flamin’ Hots get ground up and mixed in with the cheese and sauce before it’s spread onto the pizza; the tiny crumbles make it so that the Cheetos don’t get soggy while they’re baking and it also ensures that the sauce absorbs the flavor better. Once it’s out of the oven, it gets topped with whole Hot Cheetos curls. “It came out a lot better than expected,” Igraryan says. 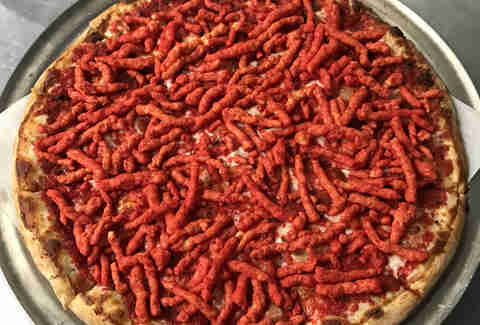 “A lot of customers actually really like it.” In fact, photos and videos of his Hot Cheetos Pizza have gone so viral that out-of-state customers, from Texas to Michigan and Colorado, have journeyed specifically to try out a slice of Ameci Pizza’s spicy pie. “There are some crazy fans out there for Hot Cheetos,” he says. No kidding. Who was the first genius to do it? There’s the age-old question, “Which came first, the chicken or the egg?” Did fast-food restaurants kick-off the trend of adding Cheetos to menu items or did they follow other eateries that were already slinging the goods? There’s a very good chance that the idea of adding Cheetos in dishes may have been embedded into our subconscious from Burger King’s Mac N' Cheetos hullabaloo over the summer since it’s been showing up in all shapes and forms. It’s even made its way to desserts. 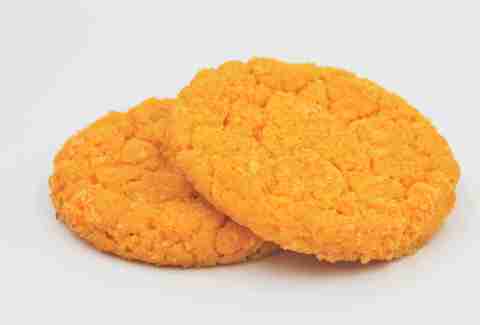 Most recently, at Cookie Good in Santa Monica, you’ll find Cheetos mixed into a sugar cookie and then rolled in the cheese dust to ensure “the famous orange fingertips,” says co-owner Ross Canter. He first thought of the idea as he was dreaming up new holiday flavors for his cookies; as he considered rolling his cookies in crushed candy canes, Cheetos suddenly popped into his head. 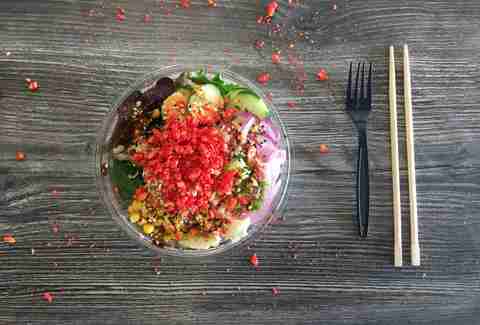 University Park’s Poke by Hawaii is another spot that just recently added Cheetos to its menu. For the last two months since the restaurant’s launch, Cheetos hounds have been able to add crumbled Flamin’ Hots to their poke bowls. Co-owner Isaac Kim gives Cheetos credit to his girlfriend, who insisted they offer it as an option during a pre-opening event. It was a hit at the event -- and the rest is history. Poke purists will argue with Kim that Cheetos just doesn’t belong in the Hawaiian bowl, but Kim says once they’re willing to try it out they usually change their tune. “What they don’t know is that the Cheetos adds a certain texture -- like the crunch aspect -- to poke,” which Kim says is relatively soft because of the fish, rice, and toppings. For other customers, it isn’t hard to convince them to add the crumbs because it takes them back to their childhood. Burger King may have pushed their breaded Mac N' Cheetos sticks into the mainstream, but one of the OG purveyors of Cheetos dishes is The Attic in Long Beach, which has been slinging its cheesy option for the last five years. These guys are serious about their coagulated Mac N' Cheetos goodness; theirs is a decadent bowl of pasta mixed with cheddar and mozzarella, and topped with Flamin' Hots. What makes their cheesy dish different is that it leans towards the gourmet end, with six different options for additions, including a ridiculously good slow-braised short rib that gets added into the mix. Will the Cheetos trend last forever? Disheartening news, but there is a light at the end of the tunnel as Barich suggests the next growing trend is all-day breakfast. He sees other major chains following in the footsteps of McDonald’s successful campaign, and that’s all right with us. Jean Trinh is a Thrillist contributor whose fingerprints are always orange. Follow her on Twitter and Instagram.